Before I left to Santa Fe, I spent a minute re-familiarizing myself with the streets on Google Maps: though I've been there a few times, it had been about six years since my last trip. 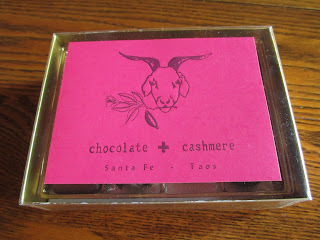 I happened on a shop name by the Plaza that I almost couldn't believe: Chocolate + Cashmere. Could it be? Could it really be? Not just some catchy name, either, but a shop that really sells both chocolate and cashmere? It sounds like a dream--a sweet dream. Really, what could be more elegant? The shop is quite elegant in setup as well as concept. It's very Santa Fe with its chic combination of simplicity, quality, comfort, and timeless beauty. Even the woman working in the shop was chic and elegant. As you walk in, the first thing you see is a glass case of truffles in the middle of the first small room. Quite the greeting. A wall to the right houses shelves of chocolate boxes, and the opposite wall has some of the shop's clothing. A small table displays their goat mascot and logo because, of course, the cashmere comes from goats. Not just any cashmere, either; they explain how they use only the finest wool. They source in Scotland but make the materials right in Santa Fe. Their clothing is designed to last through both the wear and the trends, which is a philosophy of perfection to me. There are two more small rooms with more cashmere clothing, everything from sweaters and gloves and scarves to hats and socks. While most of what you see is for women, there are men's items, as well. If I lived in Santa Fe, this is where I would shop for my winter wardrobe. But you want to know about the chocolates, right? While there were a couple of chocolate bars for sale, I was more interested in the truffles. They're made locally. You can choose individual pieces or put them together in a box. We ended up sharing a box of twelve; four are mine. The box is equipped with one of those trays to keep the truffles from bumping one another. 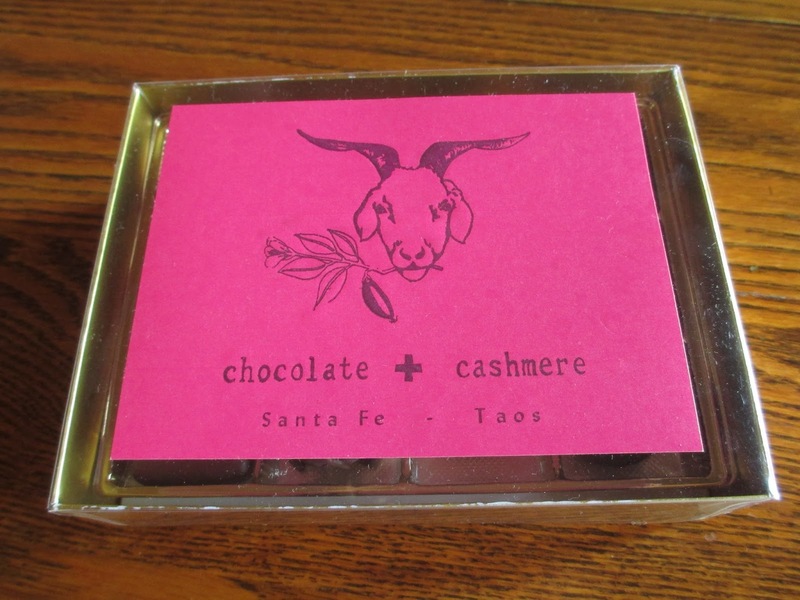 Trays are never the most elegant, but I'm sure it makes things quicker for the shopkeeper (who has to manage both chocolate and clothing) and helps keep them safe for all of the people who are traveling (Santa Fe has, of course, lots of tourists). The truffles look nice in a standard way. There is a little bit of bloom on some of them, though I'm not positive if it was there in the shop or if it just appeared on the car ride back home. (Let's face it, it's hard keeping chocolate safe while driving from New Mexico to Arizona. And I didn't want to either eat or review the truffles while I was out there.) Honestly, the four truffles I picked out aren't the best-looking bunch in the box. I also took a picture of four of the others for comparison. I'll just go one by one now. Basic Dark - A good opportunity to judge a chocolate, plain truffles allow you to taste the chocolate without distractions from other flavors. The shape of nice flat sure suggests caramel, though it simply has a standard ganache inside. The taste is like cocoa powder: fairly medium darkness and fairly sweet with twinges of a muddy sort of bitterness. It's a similar flavor to the mass-produced Belgian dark chocolates that get thrown at us. I mean, it's good: the ganache is nice and smooth and rich in texture. But I wanted it to be better; this is pretty standard and not terribly exciting. Pecan Truffle - This one came in a little dome shape with multiple surfaces. A crumbly top center made it rather messy to cut into. The light crunch is, surprisingly, similar to that of a Crunch bar. I don't think it's due to crisped rice, however; it's just that the pecans are so finely chopped. There is some salt in there, as well, which is quite a nicely placed touch, fresh and clean. There is a hint of caramel flavor. But I don't really taste the pecans, which is a disappointment given that this chocolate is named for the pecans. The dark chocolate is the same as with the previous truffle. So really the most interesting aspect is the unique texture, not so much the flavor. Goat Cheese - I had to at least try this one, for two reasons: it isn't a flavor you come across often and the goat is the store's mascot. When cutting this round truffle open, you'll see almost the same inside as with the Basic Dark, except perhaps that it is slightly redder. The taste is likewise redder and warmer--and then you get that full on goat taste. I can't describe it: you just have to know what I mean. Goat cheese has its own animal flavor and it's strong here. I'd say it goes well with the chocolate and the two blend well and that somehow makes the chocolate taste better--but I don't really like it. I would need another element to balance out the goat cheese flavor. That said, there is nothing weird about the texture, which had been a concern of mine. So by all means, try it out, and if you like goat cheese, you'll like this truffle. Maybe try smaller pieces to start, or pair it with wine and toasted almonds; treat it fancy. Lavender Sea Salt Caramel - A pretty one painted in purple, I chose this one because Santa Fe does much with lavender and while I have had lavender in chocolate before, I don't think I've come across this exact combination. The caramel (inside dark chocolate once again) is free-flowing. Does it taste like the lavender I sought? Oh, yes, most definitely. Fresh and floral and tangy, the lavender is spot-on. It comes first, then you get the pure sweetness of the caramel and a hint of salt (not overdone), and then you have the chocolate left in your mouth. The perfection of this one almost makes me wish I had chosen more caramels. This is definitely my favorite of the four. It captured the lavender perfectly and really set a scene and atmosphere. Really well done. The verdict? I guess it just depends on what you're seeking and what you choose. I'd highly recommend the Lavender Sea Salt Caramel, and I think most people will enjoy the Basic Dark. They also have more Southwest-inspired flavors, like Pecan Chile and Goat Cheese Raspberry Ancho Chile (which I didn't get because I've finally been able to admit to myself that I just don't like chili chocolates). Go and pick out a couple just for the excuse to go into the store: it's a great shop.